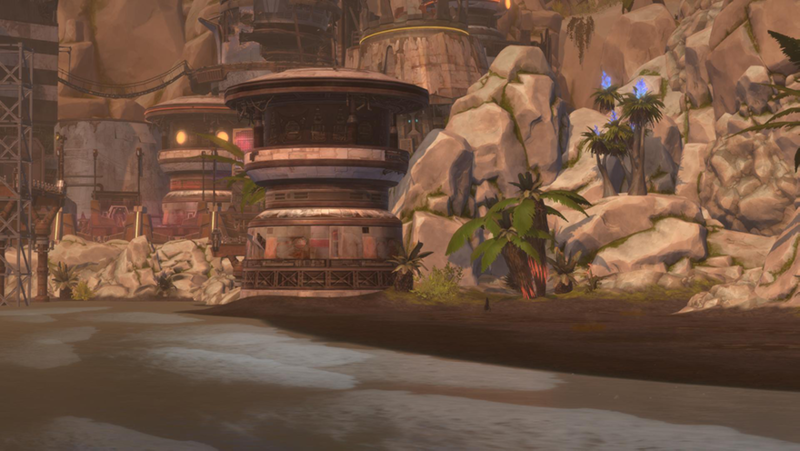 I know I took more than a moment to explain why I liked the new Rishi stronghold coming to Star Wars: The Old Republic in the next big update. It seems that the development team has a little more freedom to really listen to its fans and add items to this stronghold to move it from being a good stronghold to a great one. I’ve clearly been critical of many of the things SWTOR has done over the year, and I rarely give it amazing scores on my yearly reviews. But I’m still a fan, and it’s improvements like the Rishi stronghold that help keep me interested in what BioWare developers are doing. On a scale that includes jumping the timeline forward 5 years and killing off major characters, creating a PvP stronghold ranks rather low, but I’m surprised at how much it actually helps to create an enjoyable game. The final round of PTS changes hit this past weekend, and I spent some time goofing around and diving into these additions. Let me highlight some of the changes. The Rishi stronghold does focus quite a bit on PvP. Many of the rooms and many of the changes to the stronghold focus on the player-versus-player aspects. But one fan-requested change was totally cosmetic: the additional unlock. 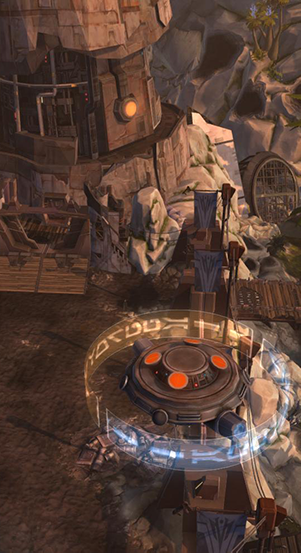 Fans on the PTS complained that the Rishi stronghold didn’t really have a home-like feel. In fact, that was a complaint about the Yavin stronghold, too. Thankfully, there was still time for the developers to do something about the Rishi stronghold. A three-room apartment was added to the stronghold this past weekend. If you’ve ever made a bounty hunter or Imperial agent character, you’ll recognize the layout of these three rooms. They were lifted from the starting cantina on Hutta. It’s clearly reused assets with a balcony attached to it, but reusing assets isn’t inherently bad. In this case, it’s pretty great and serves its intended purpose. I would like to give an honorable mention to the additional hooks add to the stronghold as well. I mentioned in my first impressions of the stronghold that “the hooks are sparse as with nearly all strongholds set outside, as on Yavin IV and Tatooine.” Well, in this latest update, that’s changed. There are hooks everywhere, including out in the middle of the water where the player can’t even reach. Color me impressed. The biggest change as to be the options button in the stronghold UI. “How is that a PvP change?” you might ask. Although the button itself is new, the true change is the ability to toggle the whole stronghold from non-PvP to full-on PvP. If you are familiar with the PvP zone on Ilum, then you’ll be familiar with how this PvP toggle works. When it’s on, you can literally PvP anyone you are not grouped with regardless of faction or level. If you are grouped with one to three other people, they will be on your team. But everyone else is attackable. I’m not a PvPer, and this excites me. I talk a lot about roleplay in MMOs, and how I think that SWTOR‘s combat system doesn’t provide a good platform for conflict resolution. This changes that. Even if it’s just for this stronghold, it’s a big step in the right direction. I know not all RPers are going to believe that PvP is the best way for conflict resolution, and I understand the arguments against PvP using game mechanics. But there are many who like the idea of PvP as a way to resolve in-game conflict, and this is a huge step in that direction. I am also in favor of the bolster terminals placed in key locations around the stronghold. I have some nit-picky issue with the bolster system, in general, but I’m on-board with its intended purpose. With that in mind, I fully support the bolster terminals in the Rishi stronghold. In theory, bolster will place everyone in the stronghold on the same playing field, regardless of level. In theory, this will make PvP more about skill than about gear, and I’m fully on-board with that idea. Lastly, I love the observation camera! We need one of these for all PvP matches. This doohicky launches when a player clicks on the appropriate terminal then allows a player to jump into the match simply as an observer. The terminal spawns a camera avatar, and you then take control of that avatar. It’s not attackable, and in this latest patch, the bugs have been fixed where it will no longer take damage from AOEs. Although the camera avatar is the focus of the game camera, it works to give the visual impression of what you’re doing. But because your “eyes” are detached from the avatar camera, you can take some great snapshots from a match. Of course, there were other minor changes made to the Rishi stronghold, but these items push the stronghold into new territory. With decorations changing line-of-sight, Rishi becomes one of the most customizable PvP experiences in MMOs. I’m really glad to see these changes, and I hope to see this whole PvP experience translated into existing and future strongholds. The Rishi stronghold launches with Game Update 5.9.2 Galactic Legend on August 7th. What are your thoughts on the new stronghold? Are you happy with the PvP aspects? What about the recent changes on the PTS? Is Rishi the right place for a new stronghold? Let me know your thoughts in the comments below. Before I go, I would like to plug a segment that I do on the Passionately Casual Podcast. People know that I like to roleplay in MMOs, and I know there are many people who would like to jump into it but just don’t know how. Besides the periodic posts I make here, I would also like to point you in the direction of my In-Character segment. In these bite-sized segments, I’ve covered subjects like the unspoken rules of roleplay to how to deal with trolls. If you’re looking to roleplay in SWTOR, then I highly recommend that you check out those segments. It’s mighty nice they have fiddled with it after player’s feedback, but it’s still dreadfully little content for what is essentially very much still a subscription based title… like way beyond acceptable. 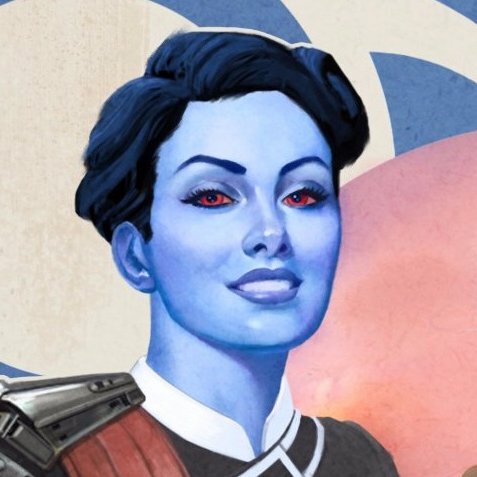 What have they done to you, bioware… is anyone left in that building other than the janitor, did they evacuate the premise after a fire drill an forgot the way back? Good job but, any news on fire pits decorations? Huttball without them is no huttball.